B. Judges should not allow their family, social, or other relationships to influence their judicial conduct or judgment. They should not lend the prestige of their office to advance the private interests of others; nor should they convey or knowingly permit others to convey the impression that they are in a special position to influence the judge. Judges should not testify voluntarily as a character witness. Public confidence in the judiciary is eroded by irresponsible or improper conduct by judges. Judges must avoid all impropriety and appearance of impropriety. They must expect to be the subject of constant public scrutiny. They must therefore accept restrictions on their conduct that might be viewed as burdensome by the ordinary citizen and should do so freely and willingly. The testimony of judges as character witnesses injects the prestige of their office into the proceeding in which they testify and may be misunderstood to be official testimonial. This Canon, however, does not afford them a privilege against testifying in response to an official summons. (1) Judges should be faithful to the law and maintain professional competence in it. They should be unswayed by partisan interests, public clamor, or fear of criticism. (2) Judges should maintain order and decorum in proceedings before them. (3) Judges should be patient, dignified, and courteous to litigants, jurors, witnesses, lawyers, and others with whom they deal in their official capacity, and should require similar conduct of lawyers and of their staff, court officials, and others subject to their direction and control. (4) Judges should accord to all persons who are legally interested in a proceeding, or their lawyers, full right to be heard according to law, and, except as authorized by law, must not consider ex parte communications concerning a pending proceeding. (5) Judges should dispose promptly of the business of the court. Prompt disposition of the court’s business requires judges to devote adequate time to their duties, to be punctual in attending court and expeditious in determining matters under submission, and to insist that court officials, litigants and their lawyers cooperate with them to that end. (6) Judges should abstain from public comment about a pending proceeding in any court, and should require similar abstention on the part of court personnel subject to their direction and control. This subsection does not prohibit judges from making public statements in the course of their official duties or from explaining for public information the procedures of the court. “Court personnel” does not include the lawyers in a proceeding before a judge. The conduct of lawyers is governed by DR 7-107 of the Code of Professional Responsibility. (d) the use of electronic broadcasting, televising, recording and taking photographs in the courtroom and areas immediately adjacent thereto during sessions of court or recesses between sessions of any trial court non jury civil proceeding, however, for the purposes of this subsection ‘civil proceedings’ shall not be construed to mean a support, custody or divorce proceeding. Subsection (iii) and (iv) shall not apply to non jury civil proceedings as heretofore defined. No witness or party who expresses any prior objection to the judge shall be photographed nor shall the testimony of such witness or party be broadcast or telecast. Permission for the broadcasting, televising, recording and photographing of any civil non jury proceeding shall have first been expressly granted by the judge, and under such conditions as the judge may prescribe in accordance with the guidelines contained in this Order. Temperate conduct of judicial proceedings is essential to the fair administration of justice. The recording and reproduction of a proceeding should not distort or dramatize the proceeding. (1) Judges should diligently discharge their administrative responsibilities, maintain professional competence in judicial administration, and facilitate the performance of the administrative responsibilities of other judges and court officials. (2) Judges should require their staff and court officials subject to their direction and control to observe the standards of fidelity and diligence that apply to judges. (3) Judges should take or initiate appropriate disciplinary measures against a judge or lawyer for unprofessional conduct of which the judge may become aware. Disciplinary measures may include reporting a judge’s or lawyer’s misconduct to an appropriate disciplinary body. (4) Judges should not make unnecessary appointments. They should exercise their power of appointment only on the basis of merit, avoiding favoritism. They should not approve compensation of appointees beyond the fair value of services rendered. A lawyer in a governmental agency does not necessarily have an association with other lawyers employed by that agency within the meaning of this subsection; judges formerly employed by a governmental agency, however, should disqualify themselves in a proceeding if their impartiality might reasonably be questioned because of such association. The fact that a lawyer in a proceeding is affiliated with a law firm with which a lawyer-relative of the judge is affiliated does not of itself disqualify the judge. Under appropriate circumstances, the fact that “their impartiality might reasonably be questioned” under Canon 3C(1), or that the lawyer-relative is known by the judge to have an interest in the law firm that could be “substantially affected by the outcome of the proceeding” under Canon 3C(1)(d)(iii) may require the judge’s disqualification. (2) Judges should inform themselves about their personal and fiduciary financial interests, and make a reasonable effort to inform themselves about the personal financial interests of their spouse and minor children residing in their household. According to the civil law system, the third degree of relationship test would, for example, disqualify judges if their or their spouse’s parents, grandparents, aunts or uncles, siblings, nieces or nephews or their spouses were a party or lawyer in the proceeding, but would not disqualify them if a cousin were a party or lawyer in the proceeding. (iv) ownership of securities is a “financial interest” in the issuer only if the outcome of the proceeding could substantially affect the value of securities. The provisions of this Canon 3 amended September 20, 1979, effective October 1, 1979, 9 Pa.B. 3365. Immediately preceding text appears at serial page (15318). A. They may speak, write, lecture, teach, and participate in other activities concerning the law, the legal system, and the administration of justice. B. They may appear at a public hearing before an executive or legislative body or official on matters concerning the law, the legal system, and the administration of justice, and they may otherwise consult with an executive or legislative body or official, but only on matters concerning the administration of justice. C. They may serve as a member, officer, or director of an organization or governmental agency devoted to the improvement of the law, the legal system, or the administration of justice. They may assist such an organization in raising funds and may participate in their management and investment, but should not personally participate in public fund raising activities. They may make recommendations to public and private fund-granting agencies on projects and programs concerning the law, the legal system, and the administration of justice. As a judicial officer and person specially learned in the law, judges are in a unique position to contribute to the improvement of the law, the legal system, and the administration of justice. To the extent that their time permits, they are encouraged to do so, either independently or through a bar association, judicial conference, or other organization dedicated to the improvement of law. Extra-judicial activities are governed by Canon 5. Judges may write, lecture, teach, and speak on non-legal subjects, and engage in the arts, sports, and other social and recreational activities, if such avocational activities do not detract from the dignity of their office or interfere with the performance of their judicial duties. Complete separation of judges from extra-judicial activities is neither possible nor wise; they should not become isolated from the society in which they live. (1) Judges should not serve if it is likely that the organization will be engaged in proceedings that would ordinarily come before them or will be regularly engaged in adversary proceedings in any court. The changing nature of some organizations and of their relationship to the law makes it necessary for judges regularly to reexamine the activities of each organization with which they are affiliated to determine if it is proper for them to continue their relationship with it. For example, in many jurisdictions charitable hospitals are now more frequently in court than in the past. Similarly, the boards of some legal aid organizations now make policy decisions that may have political significance or imply commitment to causes that may come before the courts for adjudication. (2) Judges should not solicit funds for any educational, religious, charitable, fraternal, or civic organization, or use or permit the use of the prestige of their office for that purpose, but they may be listed as an officer, director, or trustee of such an organization. They should not be a speaker or the guest of honor at an organization’s fund raising events, but they may attend such events. (3) Judges should not give investment advice to such an organization, but they may serve on its board of directors or trustees even though it has the responsibility for approving investment decisions. (1) Judges should refrain from financial and business dealings that tend to reflect adversely on their impartiality, interfere with the proper performance of their judicial duties, exploit their judicial position, or involve them in frequent transactions with lawyers or persons likely to come before the court on which they serve. (2) Subject to the requirement of subsection (1), judges may hold and manage investments, including real estate, and engage in other remunerative activity including the operation of a family business. The Effective Date of Compliance provision of this Code qualifies this subsection with regard to a judge engaged in a family business at the time this Code becomes effective. (3) Judges should manage their investments and other financial interests to minimize the number of cases in which they are disqualified. As soon as they can do so without serious financial detriment, they should divest themselves of investments and other financial interests that might require frequent disqualification. (4) Information acquired by judges in their judicial capacity should not be used or disclosed by them in financial dealings or for any other purpose not related to their judicial duties. No judge shall have a financial interest, as defined by Section 1512(B) of the Pennsylvania Race Horse Development and Gaming Act (4 Pa.C.S.A. ? 1101 et seq. ), in or be employed, directly or indirectly, by an licensed racing entity or licensed gaming entity, or any holding, affiliate, intermediary or subsidiary company thereof or any such applicant, or engage in the active ownership or participate in the management of any such entities and related companies. The term “judge” shall include justices, judges, of the Superior Court, judges of the Commonwealth Court, judges of the Courts of Common Pleas and judges of Philadelphia Municipal Court, but shall not include lawyers and non-lawyers performing judicial functions, including but not limited to masters and arbitrators, for the Unified Judicial System. Cannon 3(C) of the Code of Judicial Conduct continues to govern the disqualification of judges where the interest in or relationship with a licensed racing or licensed gaming entity or related company thereto, or any such applicant thereof, of the judge or a family member is at issue. (1) They should not serve if it is likely that as a fiduciary they will be engaged in proceedings that would ordinarily come before them, or if the estate, trust, or ward becomes involved in adversary proceedings in the court on which they serve or one under its appellate jurisdiction. The Effective Date of Compliance provision of this Code qualifies this subsection with regard to a judge who is an executor, administrator, trustee, or other fiduciary at the time this Code becomes effective. (2) While acting as fiduciary judges are subject to the same restrictions on financial activities that apply to them in their personal capacity. Judges’ obligations under this Canon and their obligations as a fiduciary may come into conflict. For example, a judge should resign as trustee if it would result in detriment to the trust to divest it of holdings whose retention would place the judge in violation of Canon 5C(3). Judges should not act as an arbitrator or mediator. Judges should not practice law. Judges should not accept appointment to a governmental committee, commission, or other position that is concerned with issues of fact or policy on matters other than the improvement of the law, the legal system, or the administration of justice. Judges, however, may represent their country, state, or locality on ceremonial occasions or in connection with historical, educational, and cultural activities. Valuable services have been rendered in the past to the states and the nation by judges appointed by the executive to undertake important extra-judicial assignments. The appropriateness of conferring these assignments on judges must be reassessed, however, in light of the demands on judges created by today’s crowded dockets and the need to protect the courts from involvement in extra-judicial matters that may prove to be controversial. Judges should not be expected or permitted to accept governmental appointments that could interfere with the effectiveness and independence of the judiciary. Compensation should not exceed a reasonable amount nor should it exceed what a person who is not a judge would receive for the same activity. Expense reimbursement should be limited to the actual cost of travel, food, and lodging reasonably incurred by judges and, where appropriate to the occasion, by their spouses. Candidates do not publicly endorse another candidate for public office by having their name on the same ticket. (2) Judges holding an office filled by public election between competing candidates, or a candidate for such office, may, only insofar as permitted by law, attend political gatherings, speak to such gatherings on their own behalf when they are a candidate for election or reelection, or speak on behalf of any judicial candidate for the same office, identify themselves as a member of a political party, and contribute to a political party or organization. (3) Judges should resign their office when they become a candidate either in a party primary or in a general election for a non-judicial office, except that they may continue to hold their judicial office while being a candidate for election to or serving as a delegate in a state constitutional convention, if they are otherwise permitted by law to do so. (4) Judges should not engage in any other political activity except on behalf of measures to improve the law, the legal system, or the administration of justice. (c) should not make pledges or promises of conduct in office other than the faithful and impartial performance of the duties of the office; make statements that commit the candidate with respect to cases, controversies or issues that are likely to come before the court; or misrepresent their identity, qualifications, present position, or other fact. (2) Candidates, including an incumbent judge, for a judicial office that is filled by public election between competing candidates should not themselves solicit or accept campaign funds, or solicit publicly stated support, but they may establish committees of responsible persons to secure and manage the expenditure of funds for their campaign and to obtain public statements of support for their candidacy. Such committees are not prohibited from soliciting campaign contributions and public support from lawyers. Candidates’ committees may solicit funds for their campaign no earlier than thirty (30) days prior to the first day for filing nominating petitions or the last day for filing a declaration of intention to seek reelection on a retention basis, and all fundraising activities in connection with such judicial campaign shall terminate no later than the last calendar day of the year in which the judicial election is held. Candidates should not use or permit the use of campaign contributions for the private benefit of themselves or members of their family. (3) Incumbent judges who are candidates for retention in or reelection to office without a competing candidate may campaign and may obtain publicly stated support and campaign funds in the manner provided in subsection B(2). Anyone, whether or not a lawyer, who is an officer of a judicial system performing judicial functions, including an officer such as a referee in bankruptcy, special master, court commissioner, or magistrate, is a judge for the purpose of this Code. All judges should comply with this Code except as provided below. Senior Judge. Senior judges who receive the same compensation as full-time judges on the court from which they retired and are eligible for recall to judicial service should comply with all the provisions of this Code except Canon 5G, but they should refrain from judicial service during the period of an extra-judicial appointment not sanctioned by Canon 5G. All other senior judges eligible for recall to judicial service should comply with the provisions of this Code. This Code shall not apply to magisterial district judges and judges of the Traffic Court of the City of Philadelphia. Specific rules governing standards of conduct of magisterial district judges, and judges of the Traffic Court of the City of Philadelphia, are set forth in the Rules Governing Standards of Conduct of Magisterial District Judges. (b) continue to act as an executor, administrator, trustee, or other fiduciary for the estate or person of one who is not a member of their family. The effective date of this Code shall be January 1, 1974. 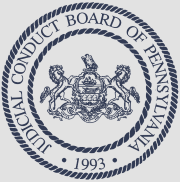 The Ethics Committee of the Pennsylvania Conference of State Trial Judges is designated as the approved body to render advisory opinions regarding ethical concerns involving judges, justices and other judicial officers subject to the Code of Judicial Conduct, and, although such opinions are not per se binding upon either the Judicial Conduct Board, the Court of Judicial Discipline or the Supreme Court of Pennsylvania, action taken in reliance thereupon and pursuant thereto shall be taken into account in determining whether discipline should be recommended or imposed. The United States Supreme Court in Republican Party of Minnesota v. White, 122 S. Ct. 2528 (2002), concluded that a canon of judicial conduct prohibiting judicial candidates from “announcing their views on disputed legal or political issues” is violative of the First Amendment of the United States Constitution.